In the south, everyone has their own way of making Coleslaw. Personally, I’m not a fan yet it makes sense why people enjoy it over a spicy pulled pork sandwich on a summer afternoon. There’s a balance in the contrast between hot and cold. 2:1 Mayo/Vinegar: 1 lb shredded cabbage. In other words, if you want to make a pound of slaw, you mix two-thirds of a cup of Mayo with a third of a cup of Vinegar and then mix it with the cabbage. 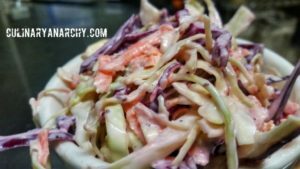 Granted, you can add sugar or even mustard, a lot of people swear by this but it’s your slaw so make it however you want to. Cover and refrigerate for a few hours so that the flavors can blend and the Vinegar can work it’s magic on the cabbage. Some people like their Slaw covered in dressing and for others, a little goes a long way. When you’re making this, add the dressing a little at a time until it feels right to you.